Internationally recognized leadership expert John C. Maxwell teaches readers how to shift their leadership to keep innovating, improving, and influencing others in today's fast-paced world. Change is so rapid today that leaders must do much more than stay the course to be successful. If they aren't nimble and ready to adapt, they won't survive. The key is to learn how to leadershift. 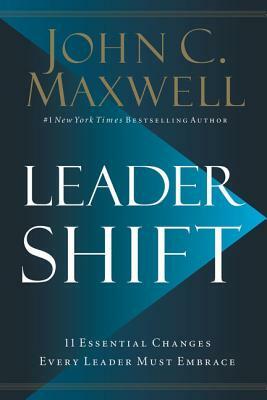 In Leadershift, John C. Maxwell helps leaders gain the ability and willingness to make leadership changes that will positively enhance their organizational and personal growth. He does this by sharing the eleven shifts he made over the course of his long and successful leadership career. Each shift changed his trajectory and set him up for new and exciting achievements, ultimately strengthening and sustaining his leadership abilities and making him the admired leadership expert he is today. Among those leadershifts are the Adaptive Shift from Plan A to Option A, the Production Shift from Ladder Climbing to Ladder Building, and the Influence Shift from Positional Authority to Moral Authority. Maxwell gives specific guidance to readers about how to make these shifts in their own lives. Each one requires them to change the way they think, act, and ultimately lead so they can be successful in a world that never remains the same.